Deliver happiness by sending this Heavenly Tasting Club Mixed Assortments English Breakfast Hamper to make others happy. 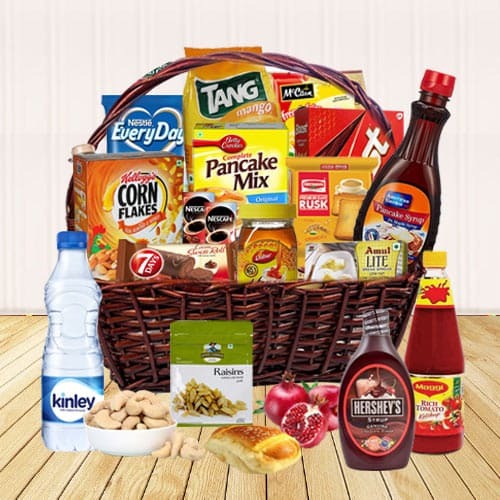 This amazing Gift Hamper is featured with Two Pouch of Nescafe, One Sugar free, One Maggie Sauce 500 gm., One Pan Cake Mix from Betty Croker 500 gm., One Pouch of Mc-Cain French Fries 450 gm., One Tang Instant Drink Mix - Mango Flavor 500 gm., One Bottle of Kinley Mineral Water 500 ml., One Boost Health Drink - Malt Based 200 gm., Pomegranate - 1 kg., Figs - 1/2 kg., Cashew 250 gm., Raisins 250 gm., One Loaf of Sweet Bun, One Rusk It, One Corrisant - Swiss Roll, One Amul Bread Spread – Lite 100 gm., One American Garden Pan Cake Syrup 355 ml., One Jar of Dabur Honey 250 gm., One Bottle of Hersheys Syrup - Chocolate 623 gm., One Can of Baked Beans, One Carton of Kelloggs Corn Flakes - Mango 300 gm. and One Pouch of Nestle Dairy Whitener - Every Day 200 gm.